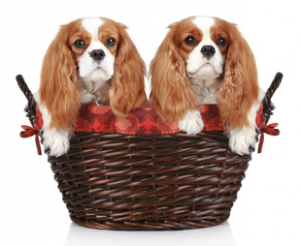 Is the Cavalier King Charles Spaniel Temperament the Perfect Dog Temperament? The Cavalier King Charles Spaniel's history can be traced back to the 17th century, and the times of King Charles II of England. These attractive dogs were specifically bred to be companions, and to keep their owners warm during the cold winters. Although the Cavalier may look dainty, appearances are deceiving. This is a sturdy, active and outgoing dog that is just as happy going for a long walk as curling up on the couch for a cuddle. Of all the dog temperaments I've encountered over the years, I believe the Cavalier is the perfect child's companion. They always appear to be happy, and they are very affectionate. Because they are small, friendly and non-threatening, they are particularly suited to children who are nervous around dogs. The Cavalier is a patient breed, and will cheerfully sit on their young master's lap and allow them to brush their long soft coat. Cavaliers are intelligent dogs and easy to train, and a youngster will take great delight in teaching their four legged best friend to sit, roll over and shake hands. They are best trained with positive methods, and because they love their food, this isn't hard to do. The gentle Cavalier will become frightened by a loud voice or by harsh handling. Children therefore need to learn to treat their little friend gently. Because of their sweet and affectionate nature, these little dogs are also a great choice for senior citizens, or even those who have never owned a dog before. 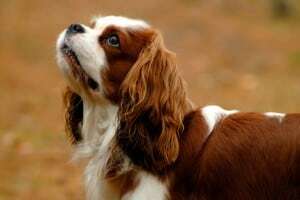 The Cavalier King Charles Spaniel temperament is loving to everyone, whether they have met them before or not. They may bark when someone arrives at your home, but they will be eager to meet them, and will welcome them with enthusiasm. This means that theirs is definitely not a guard dog temperament! Cavaliers also get on very well with other dogs, but because their ancestors include the King Charles Spaniel which was a hunting breed, they may chase other small pets. However, they can learn to live in harmony with other animals if they are allowed to get used to them while they are puppies. Separation anxiety is the most significant problem associated with the Cavalier King Charles Spaniel temperament. They become very attached to their owners, and hate being left alone. They can become destructive, and bark non-stop which doesn't make you popular with the neighbors. Cavaliers are happiest when their owner is home with them for a large part of the day, so are best suited for retirees or families with a work at home mom or dad. If you have to leave your Cavalier alone on a regular basis, I recommend that you have two dogs so they can keep each other company. Another possible issue with this dog's temperament is timidity. If they aren't given the opportunity to socialize with lots of people and dogs when they are young, they can grow up to be nervous in unfamiliar situations. This is a great reason to take your Cavalier to puppy pre-school when they are old enough, and to continue their training as they grow into adulthood. All Spaniels are hunting dogs, and in spite of their sweet gentle nature, the Cavalier will chase if they get the opportunity. They may go after other small animals, or even cars and bikes, and they may not come back when called. Firstly, they may get lost as they run blindly after their prey. Secondly, they may get injured by the car or bike they are hunting. Keep your Cavalier on a leash whenever you are out and about with them so they aren't able to chase, and they won't get hurt or lost. There are many positive features of the Cavalier King Charles temperament, and very few negatives. Those negatives can be managed if you raise your Cavalier properly, and take into account their need for companionship. The Cavalier is the ideal dog for any situation where a gentle, loving but still enthusiastic companion is needed.